This Healthy Vanilla Cinnamon Latte is a delicious paleo drink that is perfect for fall! Made with only four simple ingredients, it’s easy to make + yummy! This post is sponsored by Vital Proteins. This post may include affiliate links. Click here to read my policy. Yesterday was the first day that I went outside and felt like fall actually really was on the horizon. It was the type of morning where you need a sweatshirt on to be able to walk outside comfortably, and the kind of day where you just crave sitting on the couch under a blanket with something warm and cozy like this Healthy Vanilla Cinnamon Latte. One of my favorite things about fall is the return of warm fall flavors like pumpkin, cinnamon, and vanilla. Years ago I would’ve been the first person in like to get a Pumpkin Spice Latte at Starbucks, but after switching to eating healthier (and being more budget friendly) I’ve opted towards making my coffee at home in a much healthier way! 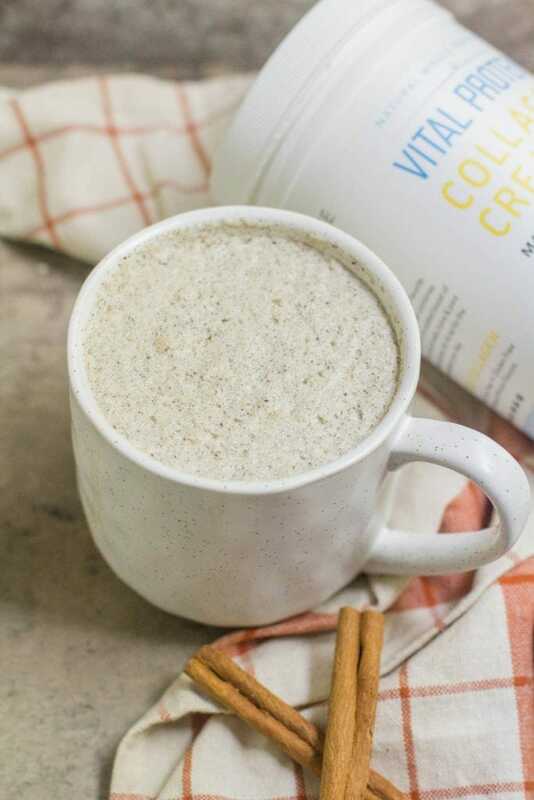 This Healthy Vanilla Cinnamon Latte is made with only four ingredients and has no sweetener added to it so you can enjoy while on your whole30 or if you’re paleo! Click here to pin this recipe for later. 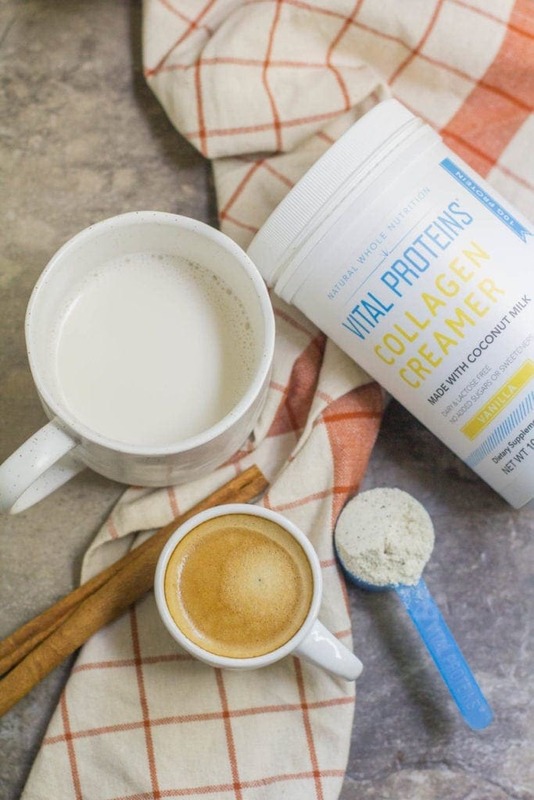 All you need to do is heat up your almond milk and blend it on high with the cinnamon and Vital Proteins Vanilla Collagen Creamer – which is the secret ingredient for giving it the perfect amount of vanilla flavor AND making it super frothy. 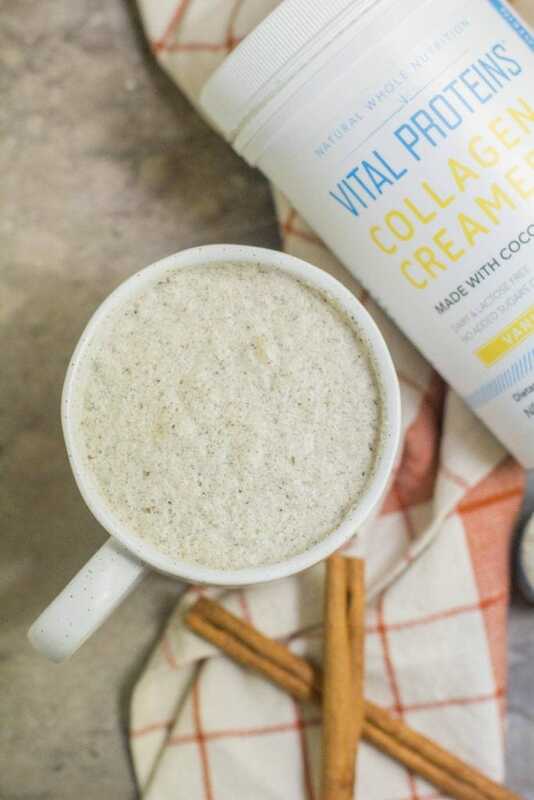 If you haven’t tried Vital Proteins Collagen Creamers – you’re missing out. It’s seriously delicious! 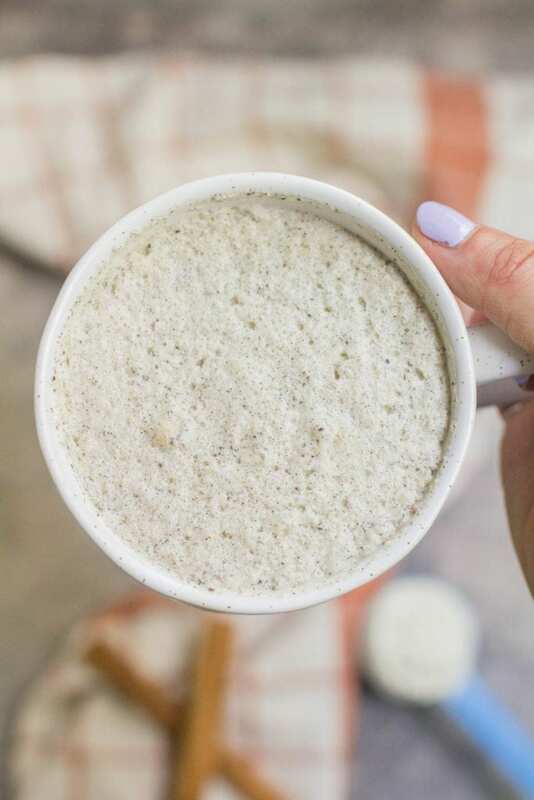 I like to add a scoop to my coffee in the morning to make it taste ‘fancy’ but I also love blending it into lattes like this Healthy Vanilla Cinnamon Latte! It makes your coffee taste faintly of coconut and vanilla, and gives it just a little bit of added richness with 10g of protein! (They even have a gingerbread one if you’re looking for holiday flavor!) I’m personally a huge fan of Vital Proteins and their products. You can read about why I use collagen in this post. If you’re looking for a simple, homemade drink to cozy up with this fall – look no further. I’ll be sipping on this Healthy Vanilla Cinnamon Latte well into the winter (and likely beyond!) It’s a delicious morning drink to get the day started, or a yummy afternoon pick-me-up. I think you’ll love it! 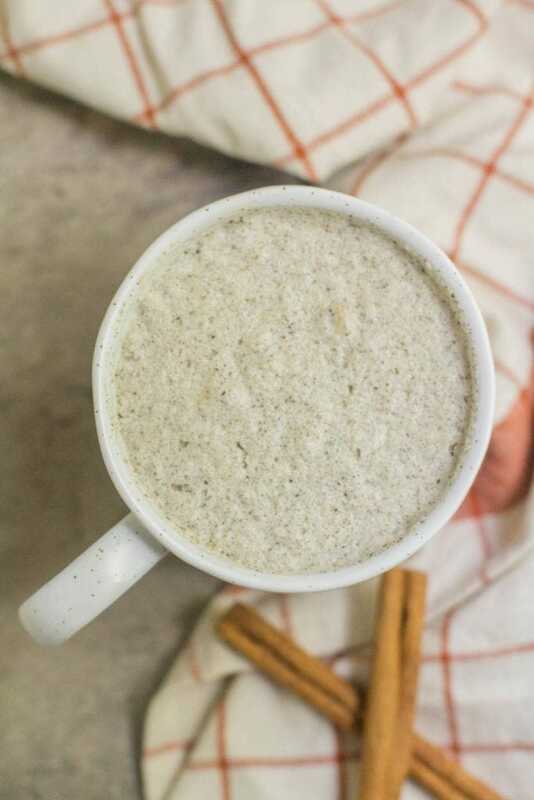 This Healthy Vanilla Cinnamon Latte is a delicious paleo drink that is perfect for fall! Made with only four simple ingredients, it's easy to make + yummy! 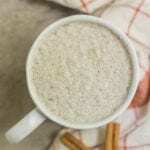 In a pan (or microwave) heat almond milk. Once heated, in a blender, blend almond milk on high with cinnamon and Vital Proteins Vanilla Collagen Creamer. Looking for help with eating healthy?Check out our 4 Weeks of Clean Eating Guide! Tried this recipe?Share it! Make sure to tag @thecleaneatingcouple or use #thecleaneatingcouple! You can get the nutrition facts for this recipe here. Nice! It is getting cold and this is nice way to get warm in the morning. One downside though is you need an espresso machine. Not a downside – just an excuse for you to get one!! We use ours all the time and it’s WAY cheaper to make it yourself than buy it out at a coffeeshop! I normally just add the vital proteins creamer I have into my coffee, but this was a yummy treat to enjoy instead. Really easy and delicious! That’s normally what I do too but it’s so yummy in a latte!! SUBSCRIBE + GET A FREE 7 DAY PALEO/WHOLE30 MEAL PLANNER! Sign up for our newsletter and receive a free 7 Day Meal Planner!